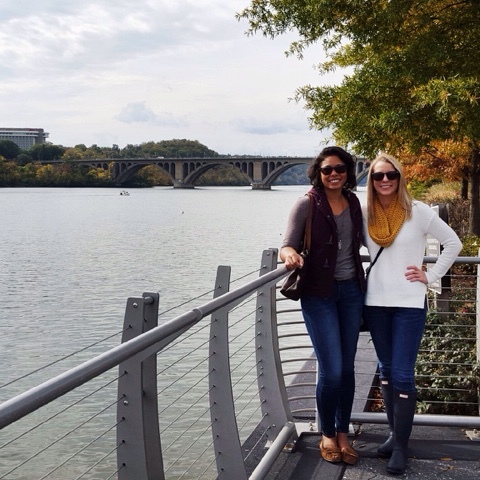 Sincerely, Emily Ann: Sister Trip to D.C.
My cousin, sister, and me at the river front in Georgetown. 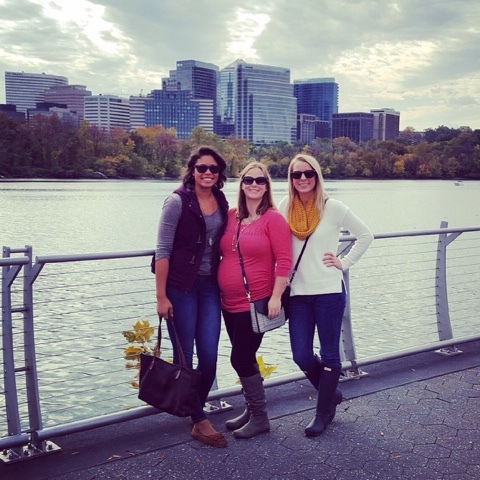 My sister and I had the best time visiting my cousin in Washington D.C. this past weekend! 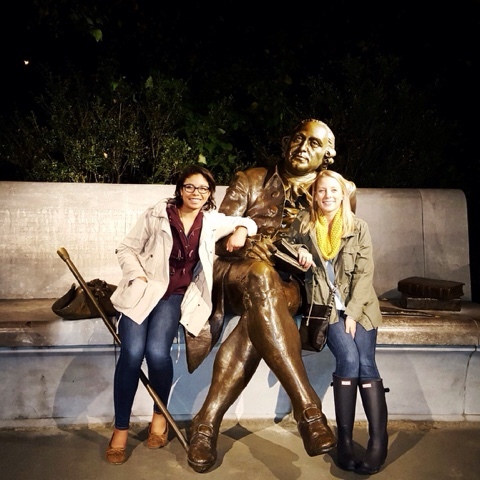 We have never attempted a sisters' trip before, and our first one was definitely a success! I loved spending time with her and my cousin while exploring a new city. It will definitely have to become a regular event. I'm already thinking of future destinations for us! Saturday, my sister and I met early in the morning to catch our flight to D.C.. We arrived around lunch time and my cousin and her boyfriend picked us up at the airport. We were pretty hungry so we headed to District ChopHouse and Brewery to grab lunch. Of course I couldn't go to a brewery and not get a beer, so I also tested out one of their handcrafted lagers. Since my sister is currently pregnant (with my 2nd nephew! ), she had to spend the whole trip drinking water while my cousin and I enjoyed several ice cold brews. Sorry, Dani! After lunch, we headed to the National Portrait Gallery, where there were tons of restored portraits of famous Americans. My favorite were the portraits of our past Presidents. After we finished, we headed to get a peek of the white house. Unfortunately, the roads were blocked off, and they weren't allowing people to get too close, but we did get a good view and even saw some snipers on the roof! We then headed back to my cousin's apartment to get freshened up before dinner. We had dinner and then had a couple more beers at another local brewery before calling it a night. Isn't my sister the cutest little pregnant lady?! If you look closely, you can see people on the roof! It was raining Sunday morning and we were feeling pretty lazy so my cousin made us breakfast and we just lounged around the apartment all morning. 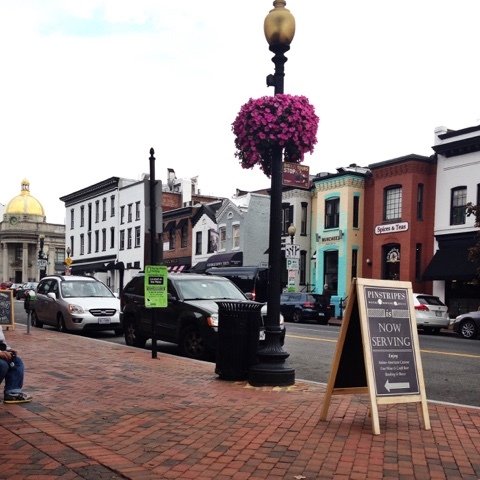 Then, in the afternoon, we headed out to explore Georgetown. It is such a cute area! There is tons of shopping, and the river front is beautiful. We grabbed Mexican food for dinner and then went to look at some of the memorials at night. 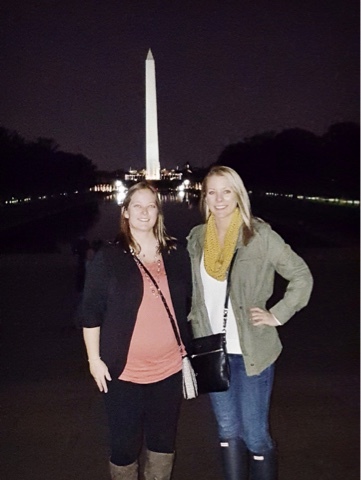 We visited the Jefferson and Lincoln Memorials and also had an excellent view of the Washington Monument. I loved seeing these landmarks at night because not only were they incredibly beautiful all lit up, but there also weren't a ton of people visiting while we were there. 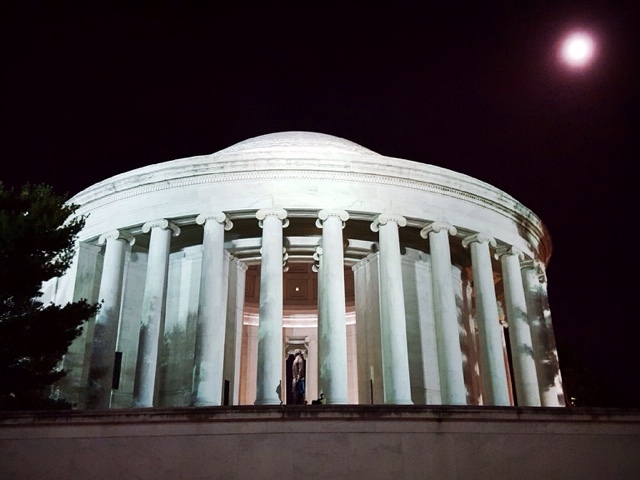 The Jefferson Memorial and beautiful full moon. Monday morning we woke up and went to grab brunch and explore the city a little more. 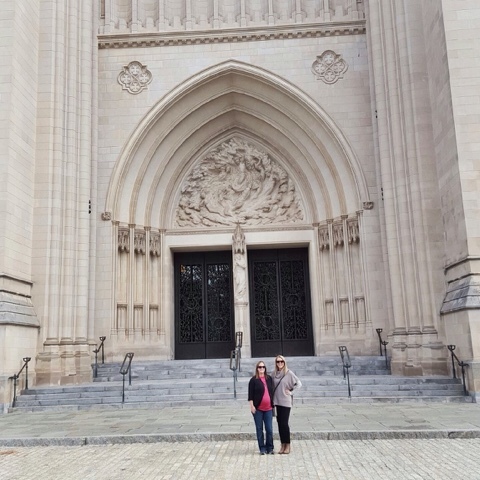 We visited the Washington National Cathedral (which was stunning) and then snacked on a little gelato before heading to the airport to catch our 3:15 flight home. 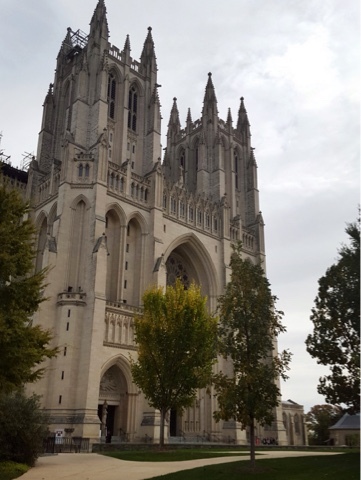 Seriously, how gorgeous is this cathedral? 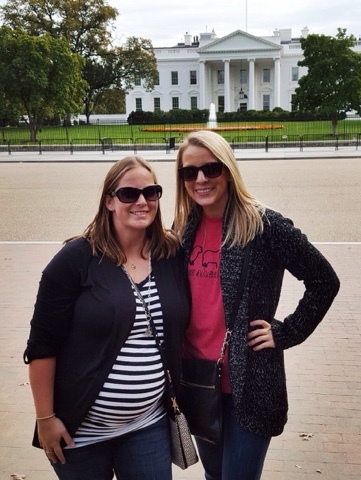 I can't wait to see where our next sister trip takes us! Love the pictures. Georgetown is certainly a charming riverfront area! Charming is the perfect word for it! 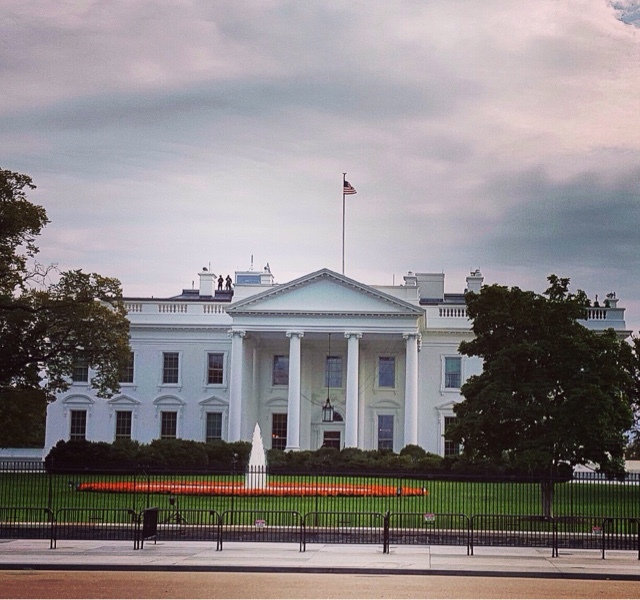 We are going to visit DC next week so I loved your guide! We definitely convinced me to visit the monuments at night to. 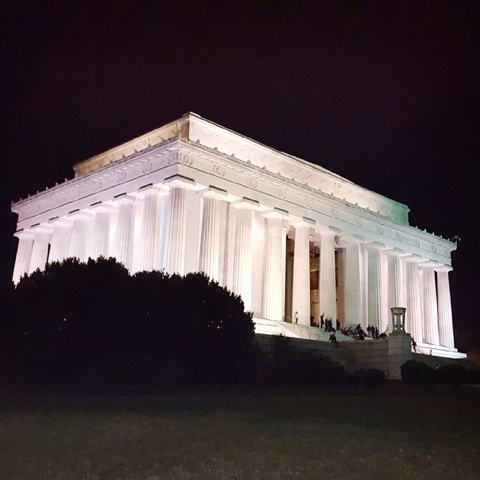 The monuments at night is definitely the way to go. So pretty, and not many people! Try not to skip Georgetown, it was such a cute area!